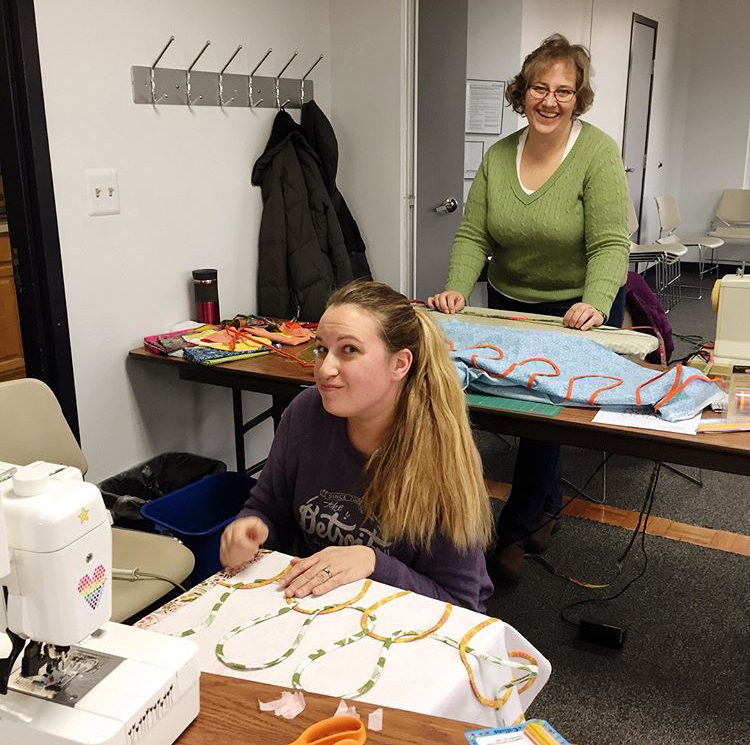 Kathy will be teaching a paper-piecing class at our February 10 sew-in. 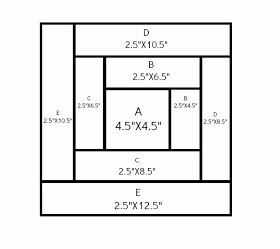 Cost is $10 plus purchase of an add-a-ruler if you don't already own one (required!). Sign up sheet will be posted soon. Guicy Guice: Still on for April, we will be working on getting the sign-up form available by the end of December. Erin Harris: plans are in the works to bring Erin in for a one-day medallion class for September 2019. We brainstormed other teacher ideas for 2020 (Sherri Lynn Wood, Anna Maria Chaney, Jacqueline DeJonge were suggested). Brenda RG will investigate. Reminder to continue to fill in the online form if you are attending sew-ins. The board has adopted a new policy starting in January where we will cancel the sew-in if less than 3 people are signed up by the meeting prior. 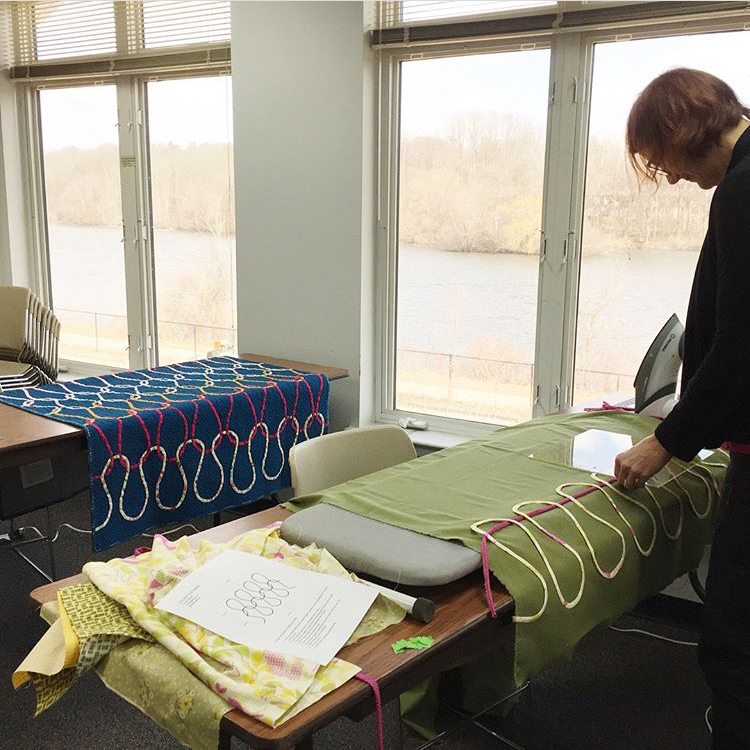 We recently held a charity-focused sew-in to work on the QuiltCon quilt. Concensus was that it was fun, well attended, and attendees got a lot accomplished. Retreat: Spring 2019 is full, but if you are interested put your name on the waitlist, there often are cancellations. Rossie notified the group that she might be getting some donated fabric for charity quilts. Jackie McG notified the group that this year to date we donated the following number of quilts. Yay group! Elections: elections are at the January meeting, we currently have volunteers to run for all the positions, however members should feel welcome also putting their name in to run for any office. For committee chairs, Tara offered to become the retreat coordinator. Kathy noted that we will have our bylaw-bingo game in lieu of reading the entire bylaws so members should come prepared to win prizes. 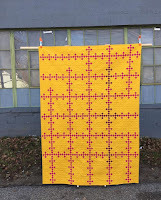 MQG: members have been having better luck navigating the MQG site; QuiltCon is in Nashville; members have until Nov. 30 to get a free show pass; Debbie G is looking for a roommate. Quilt Show: members quilts are now being displayed at the Gerald Ford Presidential Library in Ann Arbor. They will be there through mid-January. The Library is open M-F 8:45-4:45. Thanks to the show coordinators (Tara, Sherri, Giedra) and to the 12 quilters who offered quilts for show with very little turnaround. 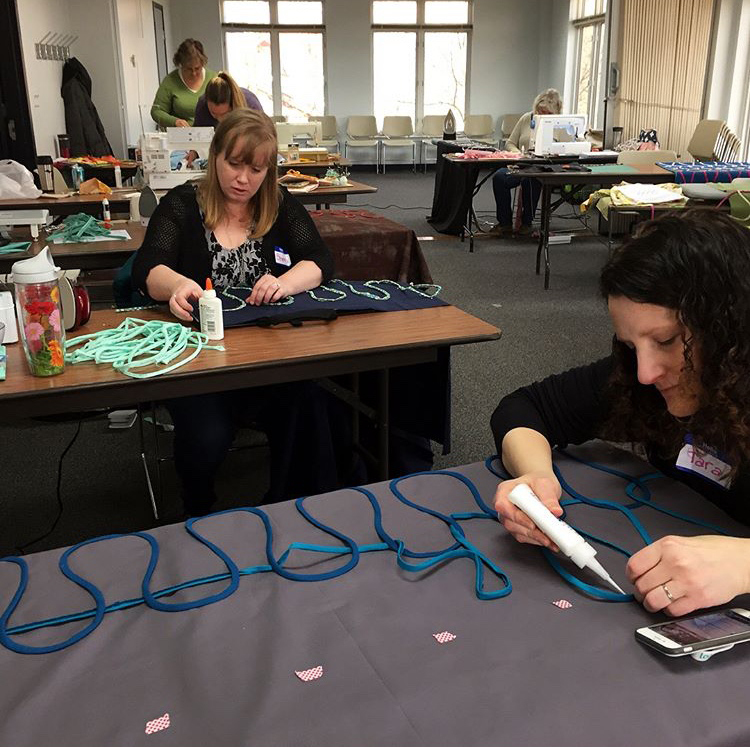 Sewing Expo: several members attended the Sewing Expo in Novi. While dollars were spent and it was cool to see the associated quilt show (which included a modern quilt display), most were disappointed at how small the expo has become. Spotlight Discussion: the group shared ideas about christmas makes. 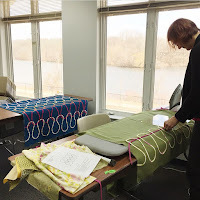 Sheryl R shared how she makes a Hot Cold Blanket (one side fleece, one side standard quilting cotton): takes 1.5 hrs to make, use 1.5 yards quilting fabric and 1.5 yards fleece (do not use no-pill); wash/dry the fabric first to avoid odd shrinkage. The meeting started with a tour of Maker Works in Ann Arbor. We saw demos of the laser cutting machine, the embroidery machine, jewelry making, wood working, etc. Maker Works is a membership facility. Lana is a member and helped coordinate the event. She is also working on creating rulers for attendees with the guild logo. Anabelle Wrigley Doodle class was a lot of fun. A few members showed off their creations. Guicy class still on schedule for April. Sign-ups will start in December. 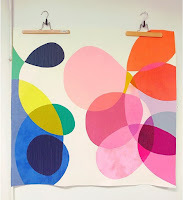 It was suggested that we ask him to talk about color theory and maybe his new fabric line when he does his trunk show. It looks like we will attempt to book Erin Harris as our 2nd national teacher for next year. More to follow. Kathy will be teaching paper piecing at the February sew-in (Feb. 10). Cost is $10 payable to Kathy the day of the event. Sign-ups will be required. Attendees had a blast at the fall retreat in Chesaning this month. 2019 Spring Retreat - Artistry on Evans, Tecumseh. May 3-5. Sign-ups have started and we are already at capacity. It was noted however to go ahead and sign up to get your name on the waitlist as we often have members needing to give up their spaces. 2020 Winter Retreat - will be in Chesaning in January. We are looking for a volunteer for Retreat Coordinator for next year. Be sure you sign up for sew-ins. Starting in January if we don't have at least 3 members signing up by the meeting prior to the sew-in, we will release the reservation back to the building in order to free it up for others to use. Rossie has picked up donations for the QuiltCon charity quilt. We will be using the November sew-in to put the quilt together. We had one 'vector' block turned in. It was decided that this block probably isn't gathering enough interest, so it was suggested that for next month, just do any 12-1/2" (12" finished) block(s) in gray with red, navy, or white. Thoughts are that the end result will be a masculine quilt for the Veterans. Jackie McG has tops/backs to be quilts as well as kits to be checked out and worked on. She also has batting and labels. We had several tops donated this month. Kim Nace has volunteered to be our Charity Chair next year. Thanks Kim! Due now. $42 by PayPal, discount $40 by check due tonight. We have added a PayPal button to the website. New members also have to fill out a membership form. Kathy will be creating an online fillable google form, so we may be having everyone fill out the form in order to get all the information in a single spreadsheet for the Membership VP. Accepting nominations. So far we have willing members for all positions, but anyone is able to be nominated for any position. See the By-Laws for details. We discussed block studies, but it was noted that members are still finding it near impossible to navigate the MQG website (requiring double logins to download materials). Pillow cover swap (could also be secret stalker or holiday themed). Sheryl noted that IKEA has $6 pillow forms and Henya mentioned that we could also do a group order with Foam Factory. Next month is a challenge - Improv (finish something of an improv nature, any size, prize will be a FQ pack of Me & You solids). Library - Kim U highlighted "Modern Designs for Classic Quilts"
Thanks to Kim U for taking notes for us! Rossie brought swatches and is asking for fabric from your stash. The fabric can only have the colors from the swatches it can not include an additional color. The September spotlight will be Brenda Ratliff. Annabel Wrigley class - close to full (3 slots open). See email or FB for sign-ups. Discussed other possible teachers for next fall and beyond. Suggestions included Heather Givens and Lizzy House. It was also suggested to the Board the possibility of some of the more expensive national teachers and how it could just be a hosted event by the Guild (not necessarily that the guild would have to feel like covering the entire cost by member attendance). Fall Retreat is about 1/2 full. See your email or FB for sign-up link. 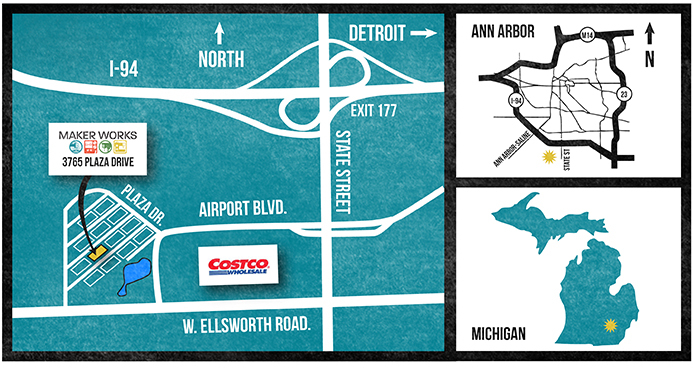 Suggested venue - Kathy is meeting with the owner of 'Artistry on Evans' in Tecumseh to see if this is a viable location. It is smaller than a lot of the places we've been to but it is brand-new and not too far away. Maggie put a sign-up sheet on FB. If you would like to volunteer to teach a skill school at a future meeting, sign-up (or contact Maggie). "If you've done it once, you can teach it!" Chicago Quilt Swap - everyone (except Sue U) has received their mini. 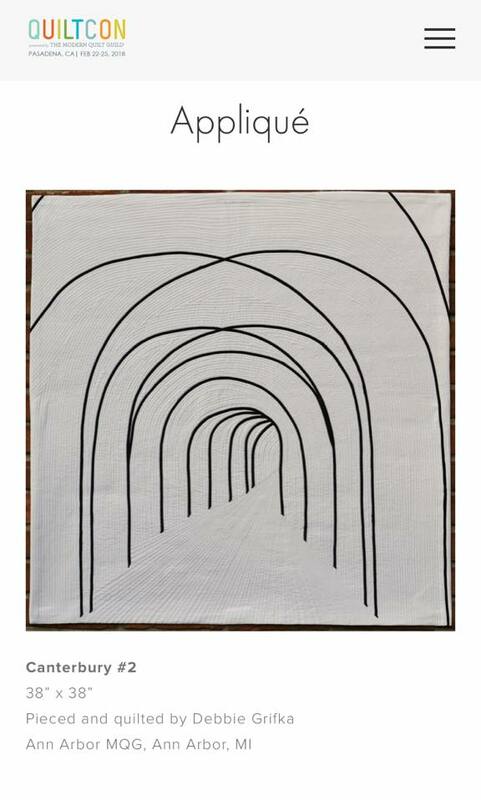 Members are reminded to email and/or post on instagram your appreciation for your quilt. Suggestion that we use the November 10 sew-in as a 'make a bag' day. 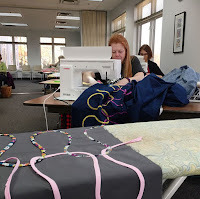 Members would like to pick a pattern and have everyone work on the same bag. Members should either post on FB your pattern suggestions (or send the board via email) and Kathy will create a Doodle Poll to narrow the selection down. Reminder that this weekend is the Greater Ann Arbor Quilt Guild's quilt show at Washtenaw College. Cost is $6. 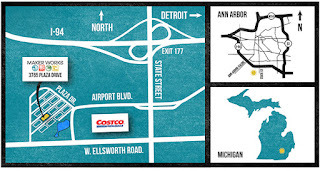 October Guild Meeting will be held at Maker Works, 3765 Plaza Dr. Ann Arbor, https://www.maker-works.com/. The meeting will include a tour and demos of some of the equipment. 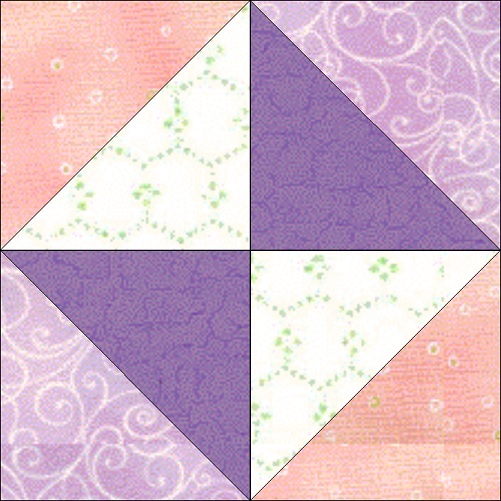 QuiltCon charity quilt design has been decided (tiny piecing in inset circles). Rossie will be sending out more information shortly. It was suggested that we purchase 1/2 yard of each of the suggested colors to make the quilt more interesting. Members will add in low volume backgrounds from their own stash. It was suggested that another charity/support we could take part in is the MSU Teal Quilt project. Here is a link to a pinwheel pattern. They are collecting quilts for a year. If anyone wishes to take part, it is in addition to our regular charity giving projects. It was decided to use the MQG airplane block for the next 2 month's charity block. Maggie will post a link on the FB page, or you can log in to MQG's site yourself for the pattern/instructions. There were enough Boats Boats Boats blocks (or almost enough) for a twin quilt. Thanks to all who made blocks and to Katie and Sheryl who volunteered to put together the top and make some extra blocks. There are still charity kits and fabric, and some individual blocks available to be made into charity quilts. There is one twin to be quilted. To date, we have donated 5 twin quilts to Ozone house, 7 baby quilts to Motts, 1 to the VA. Yay guild! Secret Stalker Swap sign-ups are happening now (quilts to be given out at September meeting). Brenda posted on FB and Kathy will send out an email. 6 guild members showed off their "Word Challenge" quilts. Jackie McG won the fabric pack donated by Brenda (and Pink Castle Fabrics). Next month (August) is a Pincushion swap. This is a Yankee Swap so bring your pincushion wrapped. Skill Share - Cheryl showed her technique for hanging mini-quilts (corner squares). This is the perfect class for experienced and beginner sewers. This workshop is all about letting go and expressing your color personality through the use of solids. Participants will start by creating a doodle - They will be given 3 opportunities to make the doodle and will then work with their favorite. We will then focus on color choice and careful tracing and cutting to create the appliqué shapes. As the day goes on, participants will be encouraged to layer shapes on shapes to explore color overlay and to create interesting shapes. Class will then continue with the appliqué sewing and quilting to finish. Please let the Board know if you have any suggestions for national (or otherwise) teachers. We are looking to have about 2 per year. Spring 2019 retreat - discussion was held as to location and timing as there are a lot of conflicts such as QuiltCon. Emily is still willing to host at her house. She will send date possibilities to Maggie. Last Year's QuiltCon quilt was auctioned off at Grillin' and sold for funds for the organization at $405. Again, thanks to all the guild members who took part in making this quilt! Rossie is finalizing the design ideas for this year's quilt. She will be letting us know shortly the design choice and tasks. Several members donated quilts they made for charities. Sheryl made a suggestion that we make Pride Flag quilts for Ozone. She offered to share some pattern ideas with the group. Reminder that we do have kits, fabric (and batting/backings), and tops that need quilting for our charities. Contact: Jackie McG if you need one of these. 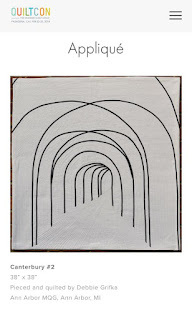 Modern Quilt Guild: no block study this month. Reminder that QuiltCon registration is open for Nashville, February 21. Library books available for check out. Reminder that you do need to be a member to check out books. Also remember to print your name legibly on the checkout card. Dorie's class on bias applique went well. There were 8 attendees. 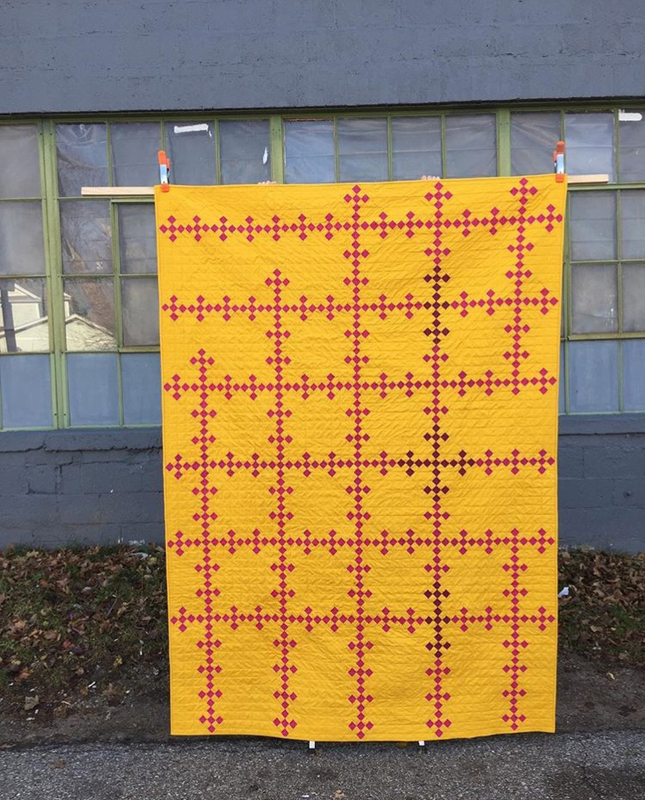 Possible next 'sew-in' class will be Kathy's "How do I quilt that!!??" lecture/slideshow to include bringing in quilts and discussing options. Annabelle Wrigley - Little Pincushion Studio "Doodle Quilt" class is on for September 30th. 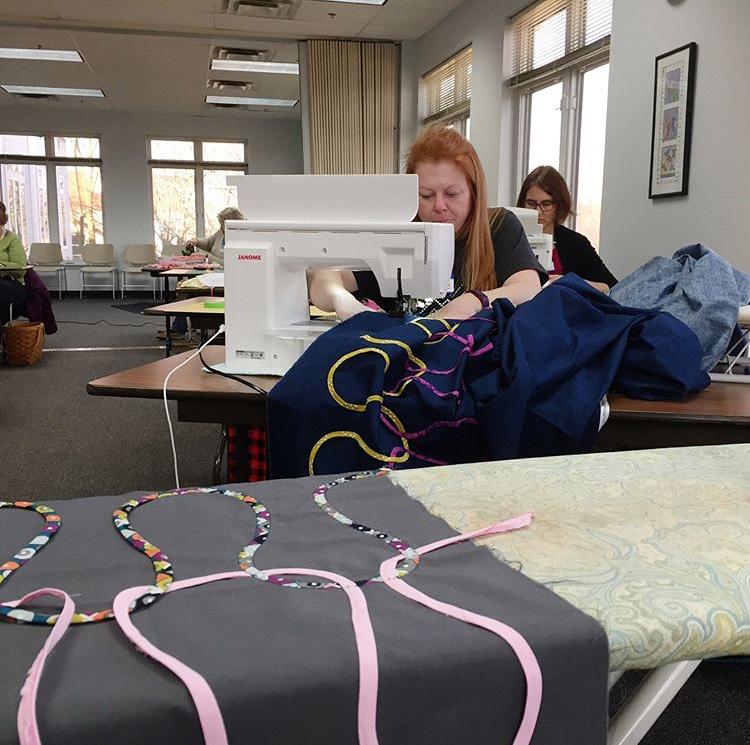 This will be a 6-hour class and her trunk show is part of the class. Cost for members $60. Sign-ups will be later in the year. Spring Retreat at Howell Nature Center is this next weekend. We had 12 sign-ups so there are still 3 openings if you don't have any dietary restrictions that need to be accommodated. Charley Harper Quilt Show - plans are in the works to organize a trip to the Cincinnati area for this quilt show the weekend of April 7-8. 3 guild members were featured in a book published by the Modern Quilt Guild, "Modern Quilts: Designs of the New Century". Yay to Rossie Hutchinson, Dorie Schwarz, Jenna Brand! This book has been purchased by the Guild and is in the Library to borrow. MQG also sent us two swag bags that we raffled off. Chicago Swap - we will be having a blind swap with the Chicago MQG. Brenda R is organizing and has provided a sign-up sheet at https://goo.gl/forms/Ww9o4iMnZBRnkZs73 Deadline is March 31st to sign up. This will be for a mini-quilt and no extras. We will get our swap partner names the first week of April and minis are due at the May meeting. We will then receive our quilts at the June meeting. Be sure to coordinate with Brenda R if you are participating but are unable to make these meetings. 3 of our members signed up for the Riley Blake challenge for MQG and the fabric is here. Check with Amy S if you need to get yours. Log Cabin Block Lottery - guild members made log cabins and they were raffled off, winner takes all. Pam E won the batch of over 30 blocks. Guild members made quite a few disappearing 9-patch blocks. Erica agreed to sew them into a top. Next month's block will be "Broken Dishes". There are many tutorials out there in the 'interwebs' but here is one: http://delawarequilts.com/BOMs/BrokenDishes/index.html. Remember that we are typically sticking with 12.5" blocks (12" finished). HINT: You will create using 6.5" HSTs. Membership: MQG cards are here - check with Jackie Mills if you didn't get yours. These cards can be used at quite a few quilt shops for discounts. it was noted that our charity entry got a lot of attention and members felt it really stood out - once again, a big thank you to the team who put this together and Dorie for designing and organizing! Dorie's daughter Eva had her first ever quilt in the show in the youth category. So exciting to see our young ones picking up the skills. 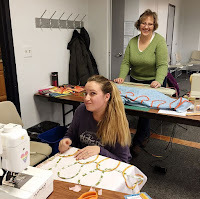 Skill Share: Brenda R gave a demo on how to make blocks using tube quilting. She reminded everyone that you end up with all bias edges so she recommends making heavy use of spray starch.